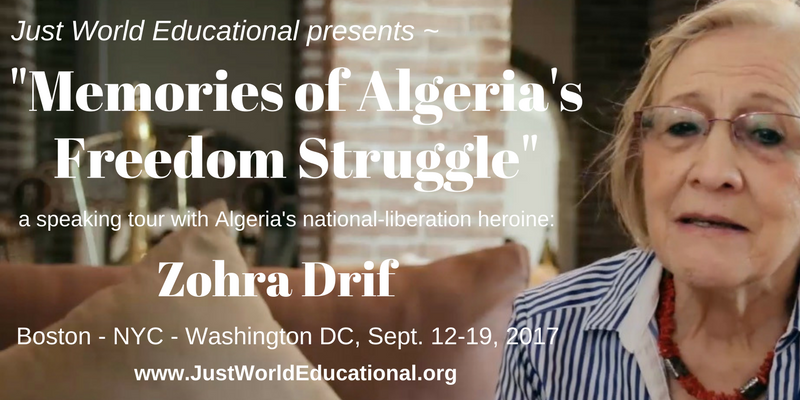 We can now share more details of the three-city U.S. tour that Just World Educational is organizing in mid-September for Algeria’s national-liberation heroine Zohra Drif, under the title “Memories of Algeria’s Freedom Struggle”. This tour coincides with the release this month of Mme. 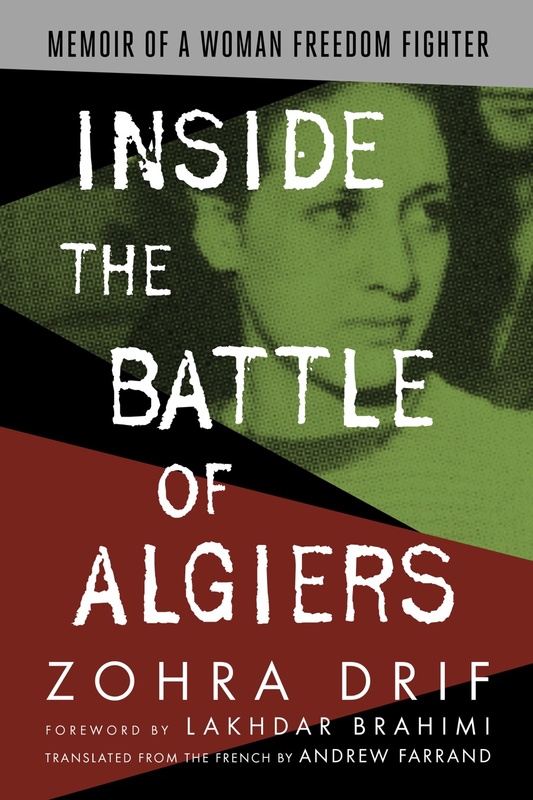 Drif’s memoir, Inside the Battle of Algiers: Memoir of a Woman Freedom Fighter , and will bring her to Boston, New York City, and Washington DC. Sept. 1957 French newspaper photo of Zohra Drif’s arrest. As a patriotic young woman in the 1950s who well understood the suffering her people at the hands of the French settler-colonialists who had ruled it for many decades, she joined the ranks of the numerous Algerians who decided to fight for their country’s independence. Their struggle received strong support from a broad spectrum of Americans– including Senator (later President) John F. Kennedy and the Black Panthers’ Eldridge Cleaver. We are please to be able to organize Mme. 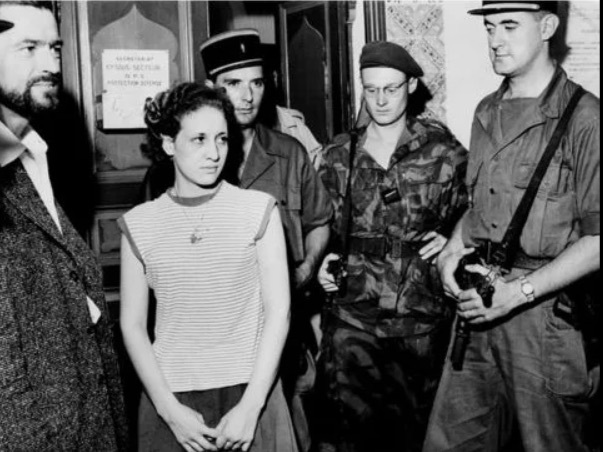 Drif’s tour on the 60th anniversary– to the month– of her arrest at the height of the Battle of Algiers, a key moment in the Algerian liberation struggle. ** Sept. 12, 4 pm, Cambridge MA: An event at Harvard’s Kennedy School of Government, where she will be introduced by Prof. William Granara; followed by a book signing at the nearby Harvard Coop bookstore. The event details are here. ** Sept. 13, 12 pm, Medford MA: An event at Tufts University, where she will be introduced by Prof. Hugh Roberts. ** Sept. 14, 12:30 pm, NYC: An event at New York University’s Kevorkian Center for Middle East Studies, at which William B. Quandt will be the discussant. Link. ** Sept. 14, 6 pm, NYC: A book party in Manhattan’s East Village, hosted by Mr. Abdeen Jabara, Esq. Details & RSVPs (requested). ** Sept. 18, 1:30 pm, Washington DC: An event at the Woodrow Wilson International Center for Scholars, with David Ottaway as the discussant. ** Sept. 19, 6:15 pm, Washington DC: An event at Georgetown University, facilitated by Prof. Lahra Smith. Link. We would be grateful for any help readers can give in publicizing these events so we can build a fine audience to welcome and learn from this historic figure! We don’t yet have final details (such as room assignments) for all the scheduled events; but as we get these details we will post them onto our public events calendar, which is here. As noted above, this memorable tour coincides with the release of the English-language edition of Mme. Drif’s memoir, Inside the Battle of Algiers: Memoir of a Woman Freedom Fighter. The book was translated from the French original by Andrew Farrand— and it has a powerful Foreword from Mme. Drif’s former FLN colleague, the renowned international diplomatist Lakhdar Brahimi. Copies of the book will be available for purchase and signing immediately after all the events on the tour. While on the tour, Mme. Drif will have a limited number of media availabilities. She will feel more comfortable talking in French than in English, but we can work with media representatives to arrange interpretation as needed.